I won’t bore you with a bunch of stuff about binding from start to finish. 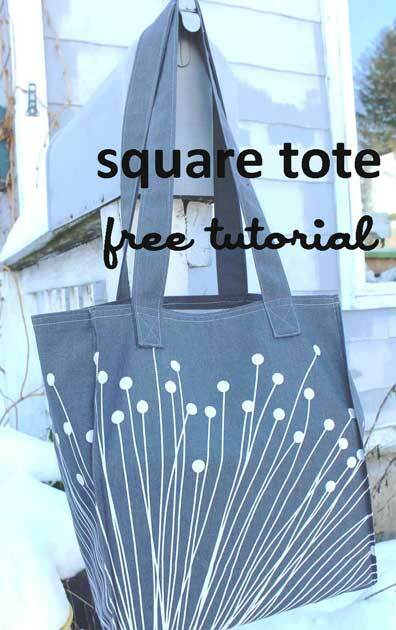 There a lot of great places to learn about binding, like from Jaybird Quilts or from Sew Happy Geek. I just have one thing to sort of add to the conversation. 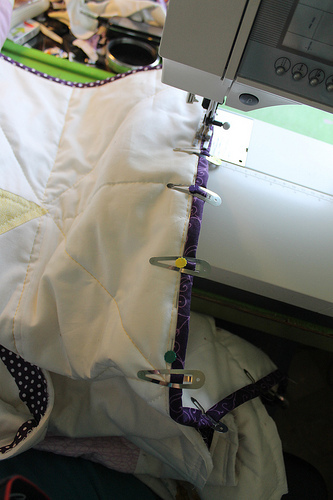 I machine sew my binding on. Some people hand-sew it, and I’m sure that’s great, but eh, not for me. 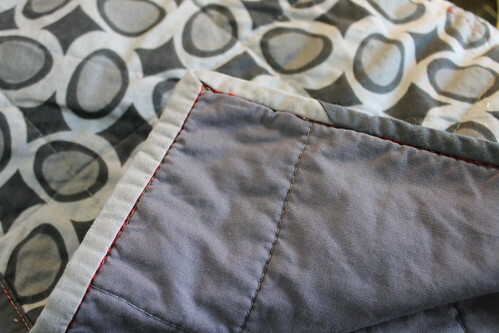 Generally, people say that when you machine sew your binding, you should sew it onto the back of the quilt, and then fold it over to the front. Here’s where I’ll toss out my opinion: Instead, I sew my binding onto the front of my quilt, and then fold it over to the back. I use binding clips to secure the binding every few inches. Then, I insert in straight pins between the binding clips, double checking that the binding on the back is caught in the pin. I like the combination of the two more than one or the other. I usually only stick in 3-4 pins at a time as I go along. This allows me to sew right along the binding, and the stitch on the front just fades into the seam. I generally use a 60 wt. thread (YLI Soft Touch currently), but sometimes I use a heavy thread, like Aurifil Lana Wool Thread, if I want the stitching to be part of the quilt design. You can probably also use an invisible thread if you like, though I have never done so. The purple binding above is a 2.5 inch binding. I used the white thread on the top, and purple thread to match the binding in the bobbin. Here’s the back of the same corner of that quilt, you can see where the bottom thread is not 100% even with the edge of the binding, but it is pretty close. My binding isn’t perfect (hahaha), but this is the best way I have found to efficiently create binding that gives me the look I prefer. 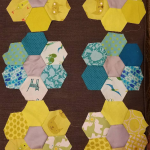 Any other tips for doing binding? I’m pretty much self taught, so if I’m doing something horribly wrong here, let me know! I do my bindings the same way on the machine, but I just use a lot of straight pins to hold it in place (no clips). 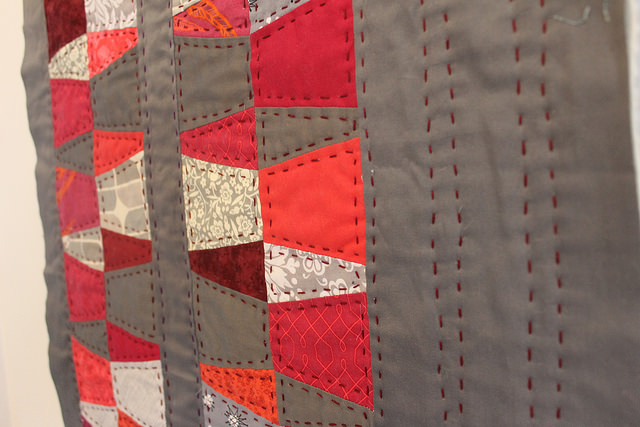 I love how quickly I can get the binding on a quilt (I get so excited towards the end to see the finished product). One thing I like to do is I serge the edge before I put my binding on. I find it holds everything together nicely when I attach the binding and it totally covered when completed. Great photos of your binding! If I still hand-sewed binding I would never get much done! Thanks for sharing! I sew my binding on the same way you do. 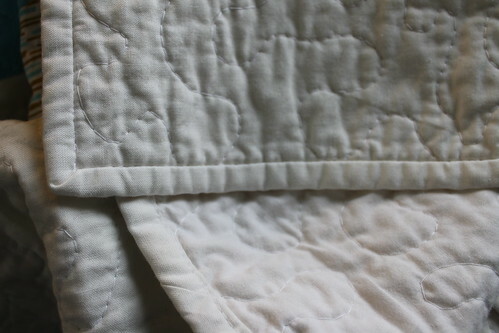 I found that machine sewed binding is “stiffer” than hand sewn, so I still do some quilts by hand. 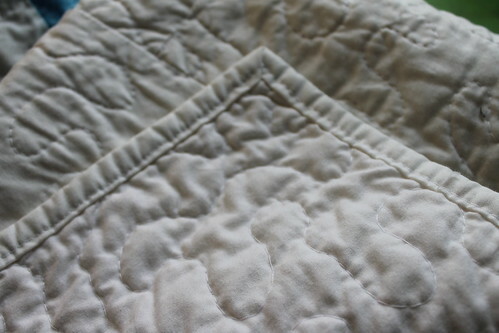 The quilts I want to do by hand usually languish in a dark corner for long amounts of time, though, because I just can’t ever seem to find the motivation to sew down miles of binding. 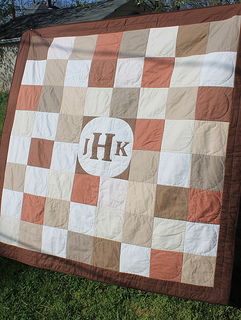 Also, and this probably makes me the worst quilter in the world, but I don’t pin my binding at all. I just sew a couple inches at a time, then stop, readjust and keep going. So far, I haven’t had any problems or wonky corners or blood all over the place. I do everything the exact same way as you with one exception – I add some washable elmers glue to hold it in place and then put a clip on. It stopped all the shifting!